The rise of the global economy has helped businesses expand their footprint. However, along with the benefits this brings, organizations have to navigate the challenge of managing their most valuable resource—their employees. HR departments are now tasked with creating positive workspaces and ensuring higher degrees of employee engagement. After all, research shows that an engaged workforce is an effective one. But there is a silver lining to this, challenges faced by the HR can be solved by eLearning. Employee onboarding is more than an orientation activity. It is a critical period where employee expectations are set. It is the first point of contact that sets the tone for employee engagement. Onboarding can be a time-consuming and effort-intensive exercise for most organizations. It is also a repeatable exercise, one that is often not customized and personalized. With eLearning, organizations can create deep and engaging onboarding experiences. It helps the HR department educate the new hires on everything that they need to know and hit the ground running. eLearning also helps in making the onboarding experience more contextual and specific. Owing to rapid technology proliferation, most industries are reeling under the pressure of the growing skills gap. As organizations globally move towards becoming digital enterprises, HR departments have to become hyper-focused to not only hire the right employees with the desired skill sets but also train or upskill their existing employee base. As all companies become tech companies because of the digital push, HR teams have to ensure that everyone, right from the entry-level employees to the C-suite, is tech and data literate. Traditional training fails to meet these needs because not only is it time-consuming but is also effort-intensive. Add the productivity impact of downtime and we know why most traditional training programs do not meet their desired outcomes. With eLearning, HR departments can create customized learning programs that can be delivered to their employees in a device-agnostic manner. These courses can be packaged in bite-sized nuggets to facilitate better retention. This will enable anywhere, anytime access, and push enablement closer to work, leading to better outcomes. HR departments are also under the pressure to have more active participants in their training programs. While employees do understand that they need training for their own career advancement, attending training programs that are held during work hours can damage productivity. Employees need the flexibility to learn. For example, field-force or sales staff who are out in the market all day can find it challenging to attend traditionally delivered classroom-training programs. eLearning solves this problem of competing priorities and scheduling conflicts as it is flexible and on-demand. eLearning also leads to better training outcomes as it reduces the cognitive load on the employees. It can be a challenge to absorb, retain, and then apply all the information during a marathon, intensive day-long training programs. eLearning employs elements like video, gamification, etc. that reduce cognitive overload, allow better knowledge retention, and enable better knowledge implementation. Given the dynamics generated by the rising number of millennial employees, HR departments are tasked with creating a culture of continuous learning. Training is the golden trump card that helps in keeping employees engaged, loyal, and stimulated for better performance. And these elements directly impact the bottom line. However, training can only be effective when it is engaging and relevant. HR departments need to account for the growing millennial population in the workforce whose expectations from their employers are very different. This is the generation driving the personalization economy. They want relevance in everything that they do. They want to be equipped with the right learning resources for impactful outcomes. They want to learn on-the-go. 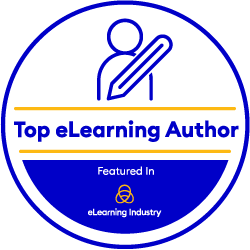 Dynamic learning initiatives, therefore, become imperative to keep this generation engaged and productive…and this can only be achieved using eLearning. With eLearning, HR departments can also proactively measure employee progress, identify areas that need improvement in the training plan, monitor progress efficiently, and provide immediate feedback as well. All these help in positively impacting the training outcomes. Globalization impacts every aspect of the business. Organizations have to ensure that all their employees are completely aware of the compliance and regulatory landscape to stay on the right side of the law. Implementing and managing compliance learning is adding great pressure on HR departments as this training, when done in the classroom, is seen as a huge productivity drain. These training activities are also often seen as boring. Low engagement during such training is almost the norm. Leveraging eLearning, HR departments can not only roll out compliance training faster, but they can also ensure that the same is made more interesting and engaging. Compliance training can easily use elements of storytelling, gamification, video etc. to make learning more effective, engaging, and impactful. Just like how organizations have evolved owing to the digital impact, training initiatives from HR need to evolve too to meet the needs of this new, tech-driven age. eLearning can become a valuable weapon to help them mitigate these challenges and drive in a new wave of efficiency and productivity. An engaged workforce will then emerge as a consequence of these initiatives. click here to get in touch with us, we’ll help solve your HR challenges. With over 12+ years of experience, our expertise at creating custom eLearning courses that engage your employees can be leveraged by your organization. You can also reach out to us at Contactus@enyotalearning.com to know more.